Cooking in the kitchen is a way to learn about culinary art and science. Recently, I have learned a few lessons through kitchen capers. This week I cleverly, I made a large batch of sweet potato gnocchi. Since I made them the day before I planned to serve them, I placed them on sheets of wax paper and dusted them with flour before placing them in the refrigerator. The extras went into the freezer for a future quick dinner. When it was time to boil the refrigerated gnocchi, I discovered that the dough had absorbed the flour in the time it waited. I had very messy blobs of sweet potato dough that had a penchant for sticking to everything they came in contact with. Lesson learned: if making gnocchi ahead of time, freeze them and then cook from a frozen state. A few weeks ago, I threw together a batch of lemon curd to make these bird’s nest tartlets for my son’s woodland themed birthday party. Since I had a lot of things in process at once, I forgot to taste test the curd before filling and baking the tartlets. BIG MISTAKE. The tarts were on the sour tart side – not suitable for serving. Lesson learned: always taste while cooking. 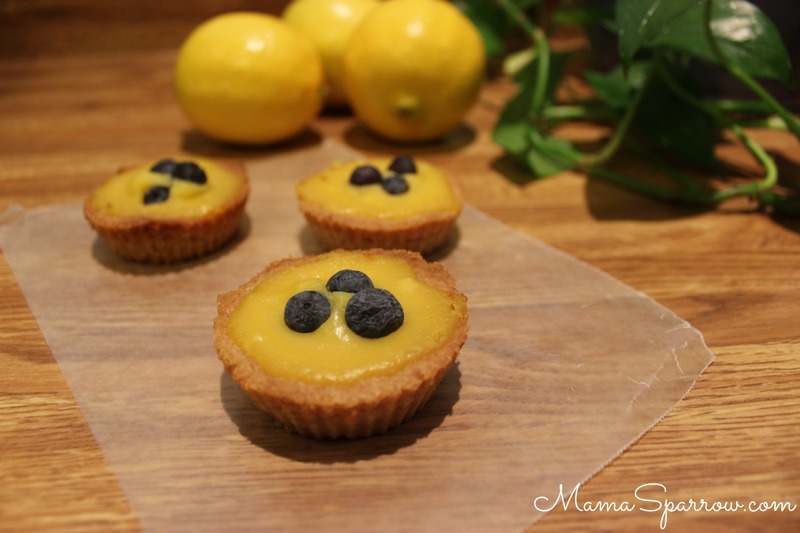 This lemon tart recipe has been lovingly designed to give credit to the tartness of lemon with a sweetness that lets you savor every bite. Oh, and the cuteness factor has great potential if you arrange your berries just so or add some robin’s egg candies. You can find my recipe for homemade lemon curd here. Hope you enjoy! Share a picture in the comments of your recipe results. Form ping pong sized balls of dough. Press them into regular size silicone muffin liners bringing the outside crust sides about ¾ of the way up the side. A greased muffin tin or even mason jar lids will work, but I find that silicone liners are infinitely easier when it comes to clean tart removal. Prick the bottoms of the crusts with a fork. Bake the crusts alone for 15 minutes or until the crusts are firm on the outside and slightly puffed. Spoon 1-2 TB of the filling into each tartlet, carefully spreading it evenly. Bake another 13-18 minutes until the cream on the outside is beginning to firm, but the center of the tart should still jiggle some. Allow the tart to cool. The cream will set more as it cools down. *Dairy free & Soy Free option: replace the butter with a soy free vegan butter replacement. My favorite is Earth Balance soy free vegan buttery sticks. They use pea protein rather than soy.